Lettuce is a name for a Tokyo Mew Mew anime character, a rager band [sorry, no link], a group of ladies [no, no link], an initiative to prevent e. coli eruptions, a Sydney taxi driver with a blog, a Yuma Lettuce Days festival, and, well, you get the idea. Pets are probably named Lettuce. Just google lettuce. It’s amazing. Doesn’t anyone use the name as a food? The lettuce plant has a short stem initially (a rosette growth habit), but when it blooms, the stem lengthens, branches, and produces many flower heads that look like those of dandelions, but smaller. This is referred to as bolting. When grown to eat, lettuce is harvested before it bolts. Lettuce is used as a food plant by the larvae of some Lepidoptera. Perhaps they should know that lettuce is also used as a food plant by slugs, snails, birds, a certain large gray cat of unknown origin, and humans. Fill a flower pot, or nursery pot, or leaky soup pot (anything that drains well) with some fine fluffy dirt. Sprinkle those tiny seeds on top. Use a stick or finger to gently move the seeds around so that they are not too crowded. Keep watered. Water gently with a mist. 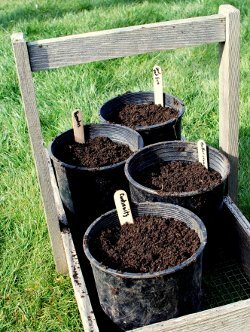 When the plants are large enough to transplant, gently tip out the seedling pot, set the ball of soil in a bucket in a few inches of water, twirl your fingers around in the water to loosen those tiny roots. Gently separate the little plants, pulling out each one to plant in a hole in their final home. 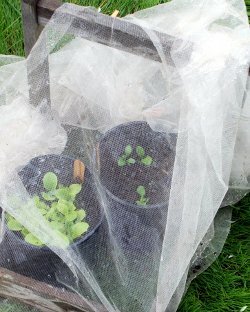 You can see from the photo that I cover the nurseries with nylon netting, to keep out the slugs. One of our large slugs has been know to devour the entire pot of young lettuce in one night. I actually found the marauder hiding under the pot. He’s gone now. Lettuce comes in lots of varieties. 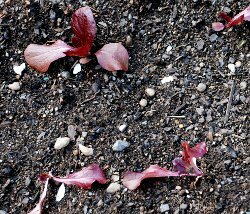 This year I have, so far, planted New Red Fire, a leaf lettuce; Continuity, a butterhead; Buttercrunch, a butterhead, and Romulus, a romian. All from Territorial Seed. There are other varieties, sometimes including the word “summer” to indicate that they are slower to bolt in the summer heat. Just after setting out the seedlings, we had heavy rain and wind for several days. The little starts did get rather battered, but they now seem to be coming out of it. 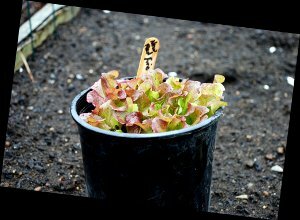 For the purpose of this article as a garden log, I planted the lettuce seed on March 21, transplanted the seedlings on May 8. Now is the time to start another crop. I’d better get busy. I am very thankful to this topic because it really gives up to date information. i really love the taste of lettuce on my homebrew russian salad.